As I mentioned last week, we recently signed up for a meat CSA that delivers a nice mix of beef, chicken, and lamb every month. 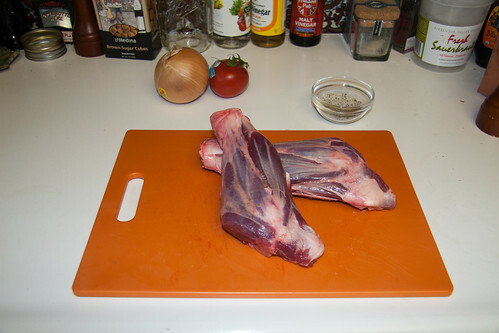 Lamb shanks have so far been a regular inclusion, which delights me to no end, since they are one thing that I’m almost guaranteed to order if they’re available at a restaurant (unless there is rabbit, in which case Thumper usually wins). I had never made lamb shanks at home, but my hand was forced and it was time to attempt one of my favorite dishes. I did some searching for a recipe that sounded like the Italian-ish preparation to which I’m partial. I finally happened upon an NPR article with a variation on an Alice Waters’ dish that looked both approachable and traditional. I figured that the doyenne of fresh, local cuisine would not lead me astray. I cut the recipe in half to accommodate our household of two and got cracking. I began by trimming the excess fat and the membrane from the outside of the shanks. Next I rubbed them with salt and pepper, and browned them all over in a hot pan of olive oil. 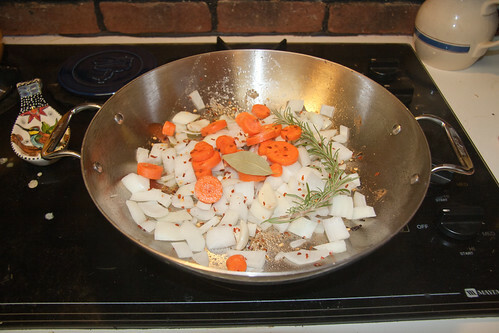 Once they were browned, I poured off most of the oil, and tossed in some onion, carrot, rosemary, crushed red pepper, and a bay leaf. 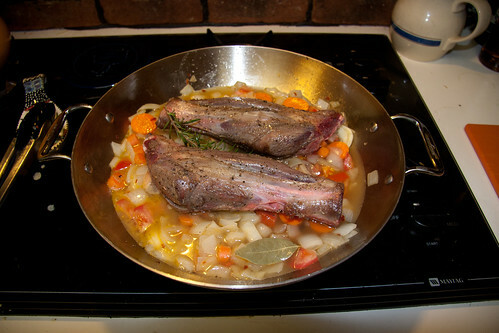 Once these were soft, I deglazed the pan with some white wine and a tomato, then put the lamb shanks back in, along with a cup of beef broth. I covered it and put it in the oven, set to 325°F. 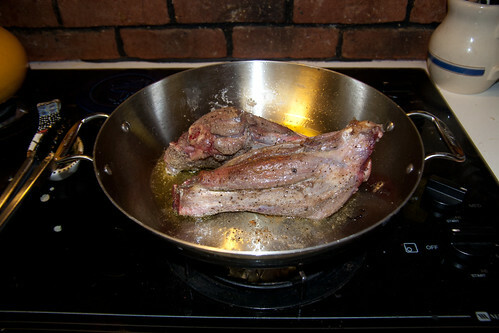 After about two hours of cooking, I removed the lid to let the shanks brown for the final 20 minutes. 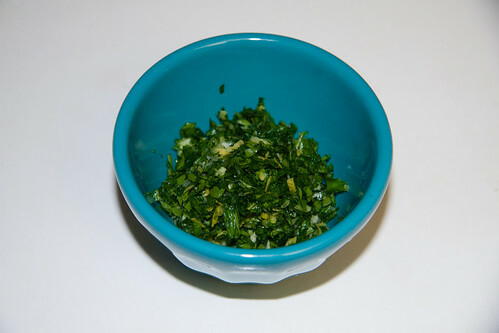 Meanwhile, I mixed up a little gremolata of parsley, garlic, and lemon zest. When the shanks were done, I removed them from the pan, then poured the vegetables into the food processor and puréed them. 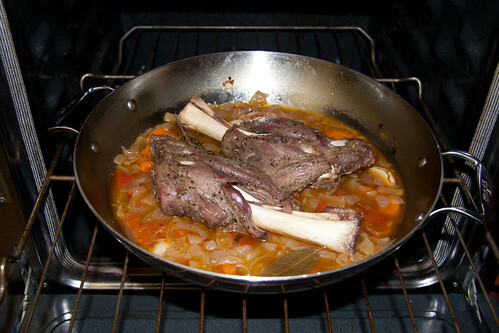 I then returned the purée to the pan, got it up to a nice simmer, and put the lamb shanks back in for a minute or two. 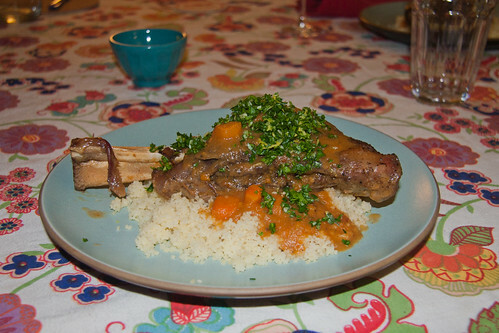 We served the lamb shanks over couscous with the sauce and gremolata on top. 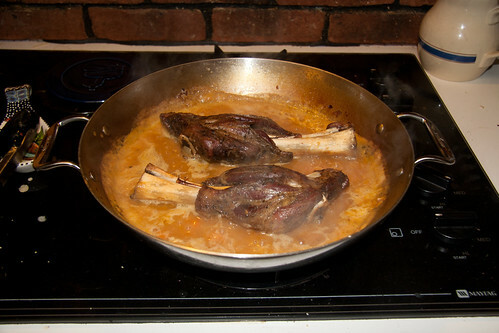 This is a fantastic recipe for what I consider the most typical lamb shank preparation. The meat was extremely tender and falling off the bone. We didn’t even need knives. The gremolata adds a nice kick from the garlic and lemon zest. If you’ve got lamb shanks and you’re not sure what to do with them, this is it.